St Davids has been a welcome revelation. We've found a city that is small with a village atmosphere, surrounded by excellent beaches and an interestingly rugged coastline. 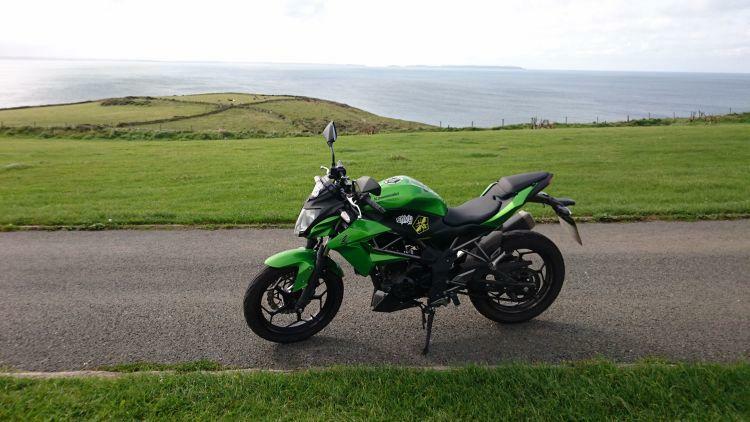 It is time to move on although not too far, just 36 miles across the body of the peninsula to Tenby. Come on sweetie - time to hit the road. 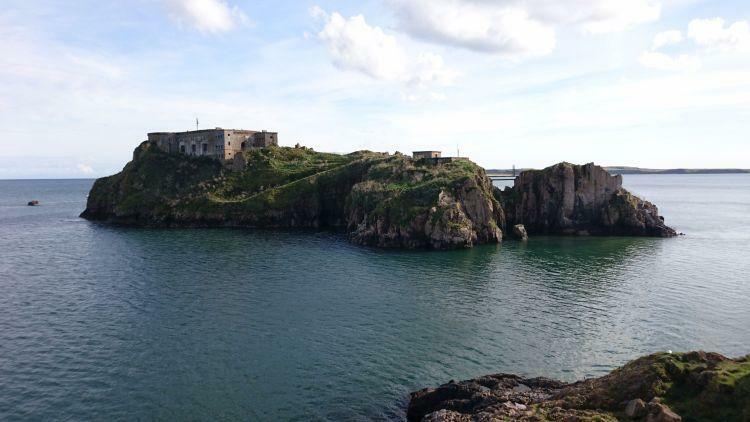 Every time I've mentioned we're going to South Wales and Pembrokeshire almost everyone says "Tenby! Oh I love Tenby." This has made me cautious. Whenever everyone loves a place I build this perfect image of the idyllic place and I am proven wrong. Will the same happen with Tenby? I'm going to find out soon enough. We're travelling through countryside mixed with small villages as I approach and so far it's looking good. Oh good - soon I will see quaint little thatched Welsh cottages, people wearing traditional Welsh dress and then lo - A golden glow will enshroud a coastal version of "The Shire" from The Hobbit's Middle Earth. All will be lovely and all will be perfect. Nah, of course not. I don't know where all my friends have been but the outskirts of Tenby appear to be as ordinary as any other town. Oh don't get me wrong it's not a dump but then neither is it one of The Seven Wonders Of The Modern World. I'm containing my disappointment as we get lost amidst everyday streets and standard shops. I don't recall concrete apartment blocks and Transit Vans being part of the dream. Our campsite is a Haven Holidays site, Kiln Park to be exact. Considering the price includes access to all the facilities I think £8 per person per night is good value, the same price as the campsite we've just left. Not that we'll use the swimming pool or the entertainment lounge but you know, well, it's there if we want it. The reason for choosing this site is it is within walking distance of the town. After pitching we walk into town. 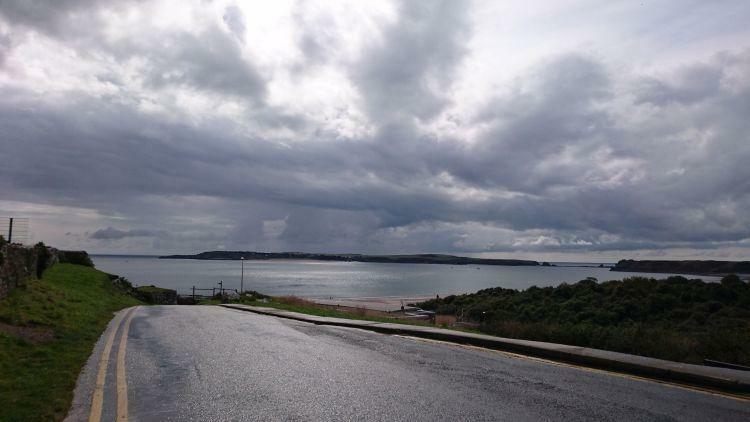 Tenby it seems is a town of two halves. 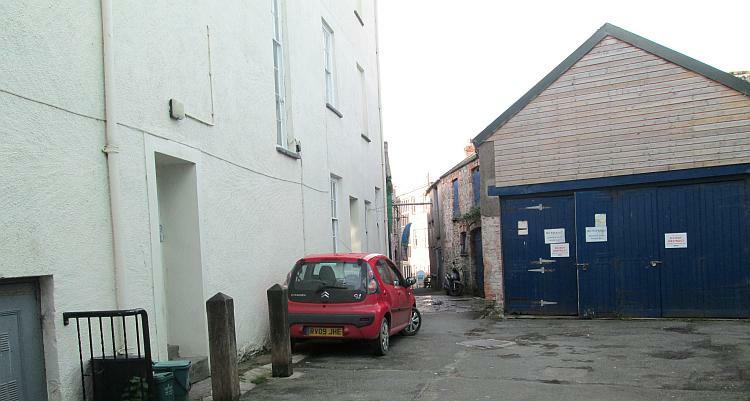 The outskirts are merely ordinary but as we approach what I figure is the old town I finally discover Tenby's spark. Oh my. To start off as we walk atop a cliff there's a beach below us, broad, sandy, golden, long and spacious. Up here on the cliff the hotels look way out to sea from on high while drinks are taken on precarious yet pretty and enticing cliff-side gardens or patios. The temperature is ideal for walking and with our bike gear back at the site we are unladen and free. We pass through an ancient wall into narrow streets with higgledy piggledy houses and flats. The angles and the shapes draw me to look harder, to peer through windows and to try and work out what fits where and why. It is fascinating and interesting, much more so than the homogeneous streets of home. The harbour has small boats bobbing within and more hotels on the cliffs. The shop brands are familiar but the shops are squeezed into old houses, warehouses and merchant buildings. Behind every restaurant lies a tiny cottage with a crooked garden, behind every street is a hidden courtyard with a stray car and shuttered workshop. I could explore for hours and hours. While not beautiful even the back streets are curious and fascinating. 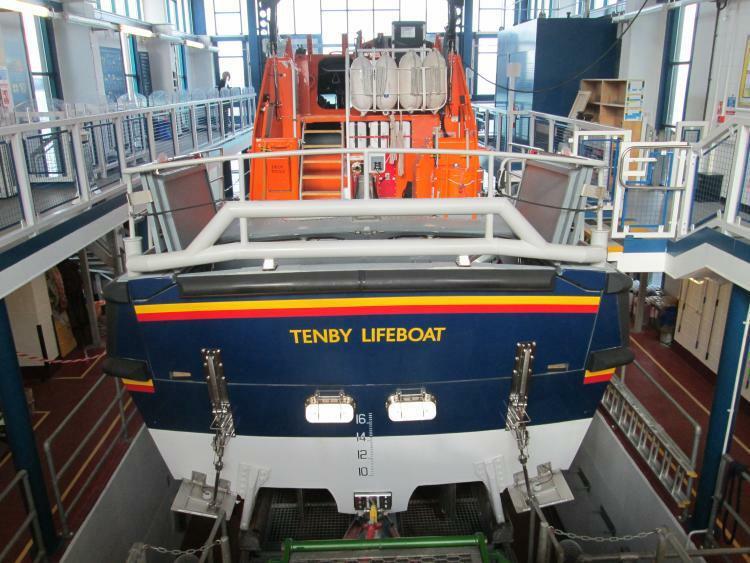 The lifeboat station is massive, impressive and worthy of our support. Even I, Ebeneezer Scrooge Withnell, tosses some small change into the donation tin. 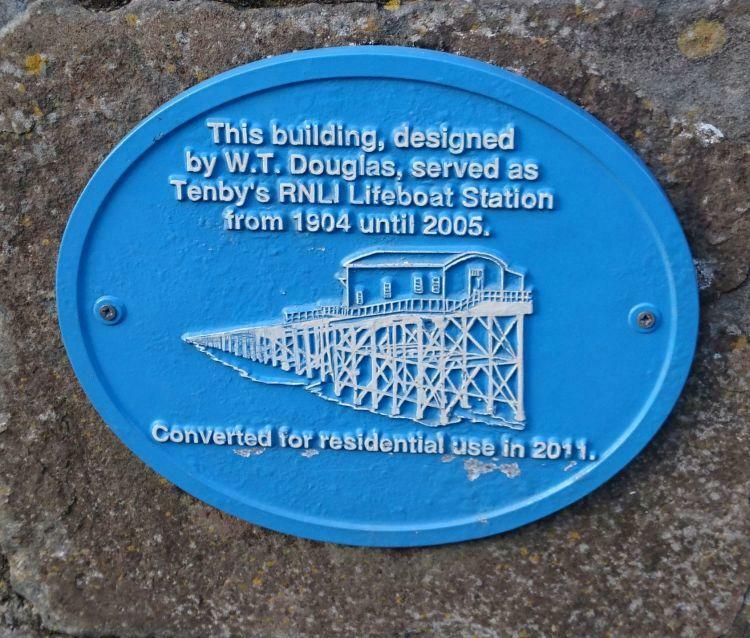 It's worth noting the old lifeboat station next door too. I remember seeing this on "Grand Designs" being converted from boathouse to domestic dwelling. It's a hell of a place to live I'm sure. Top job chaps, keep up the excellent work. 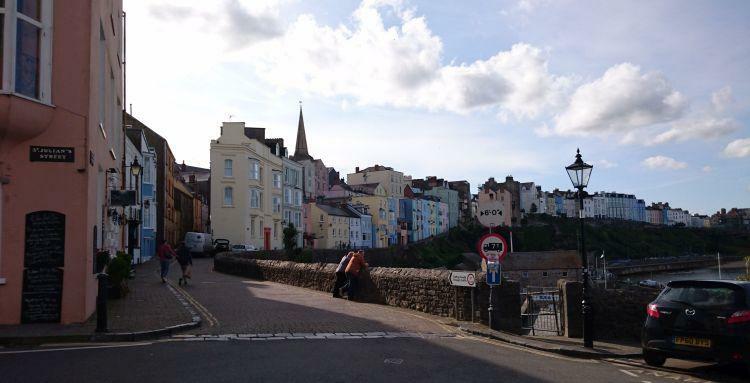 I, I must admit Tenby's muddled up intriguing compelling town centre and harbour has endeared itself to me. As we sit on a ramp looking out to the fortress of St Catherine's Island while eating ice cream I am in a good place. We walk back along the long beach and back to the tent for tea. We awaken to sunshine. This is most welcome as we shall be packing up and on the move again today, what a blessing. 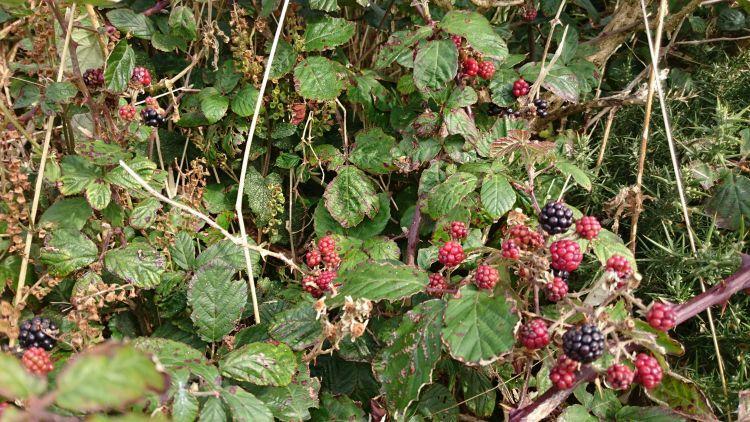 I stand and gaze at the shimmering sea while picking the last of the juicy blackberries that are growing behind our tent. It is one of those mornings that you spend time to just be grateful for being where you are right at that moment, be still and breathe. Farewell St Davids it has been a pleasure. It is nice to be riding my own bike today and I am having a good time. That is until it begins to dawn on me that these roads are beginning to feel familiar. Isn't that? Oh bloody hell it is. 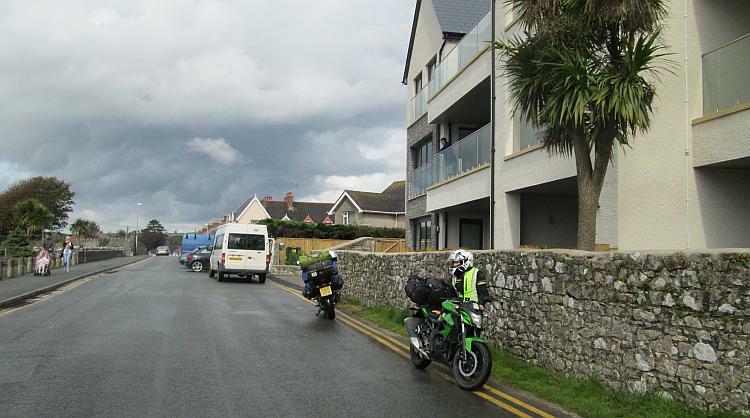 This is the road into Newgale which means it is the road with the downhill switchback. You know the one I said to myself the other day I was glad I was not on my own bike because I would have not been able to do it....aarrgghh!! Well it looks like I will be doing it now. I am directly behind a motorhome as we get to the switchback. The motorhome is being very cautious and going slowly, so I am going slowly too and to my utter amazement I do the switchback with amazing ease. No panic no drama just an easy sharp turn. Well would you believe it? Therein lies the answer to all my terrified switchbacks, I just needed to slow the hell down to make myself more comfortable with them. WOW! every day is a school day. This boosts my confidence a bit because hey I might not so bad a rider after all. Everything we do is physical but also mental. Sometimes we are restricted by our physical capabilities but often our mental attitude can severely affect our abilities. Mentally I had told myself I could not do that switchback. Given a choice in the matter I would have taken another route to avoid it. However forced to do it I overcame this self imposed mental block. I was physically able to do it. The only thing that could have stopped me was my own mental attitude. I talked a lot about kicking the "t" of the end of "can't" and ending up with "can" in my blog about being a terrified learner (Are You A Terrified Learner Rider? I Was). It will serve me well to remember my own advice from time to time. 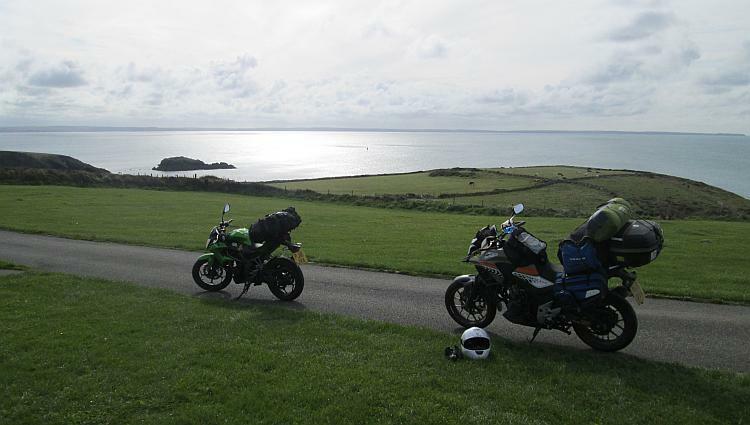 We eventually arrive at our chosen destination of Tenby. Again this is another recommendation from my friend but also from Ren's friends. So much so that Ren is sure he will be disappointed. 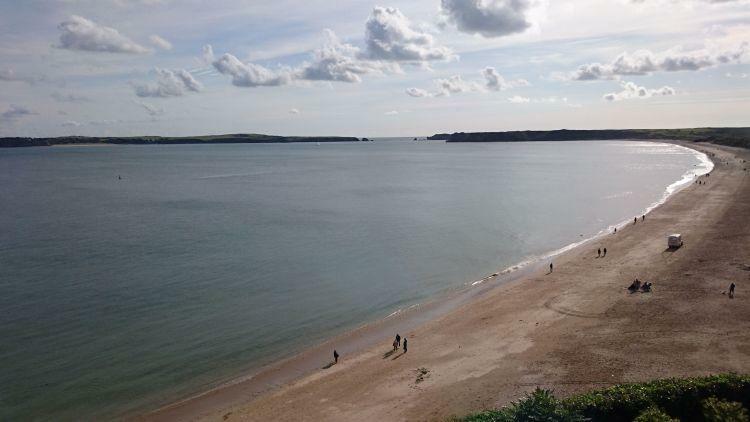 We decide to find the campsite first and then have a walk into Tenby to explore later on. Finding the Haven Kiln Park site proves a little troublesome. After going down a few incorrect roads we get there in the end. Haven is not our usual choice as we prefer the smaller campsites. I used to go occasionally to Haven sites when my children were little as they provide the likes of swimming pools and the kind of entertainment that children love. Now my children are adults I tend to avoid giant furry tigers and pink elephants. 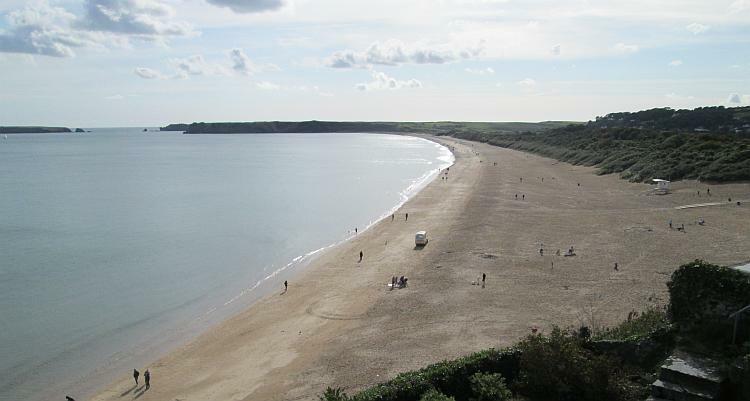 However this one is close enough to be within walking distance of Tenby town and this is the main reason for choosing it. It is a clean and smart looking and well maintained campsite. The tent field is as usual though the one area that is not as pristine as the rest. It is not very well drained and as we survey where to pitch a friendly fellow camper points out areas where previous campers had to move due to getting flooded. We choose a area that has a slight rise to it and hope for the best. 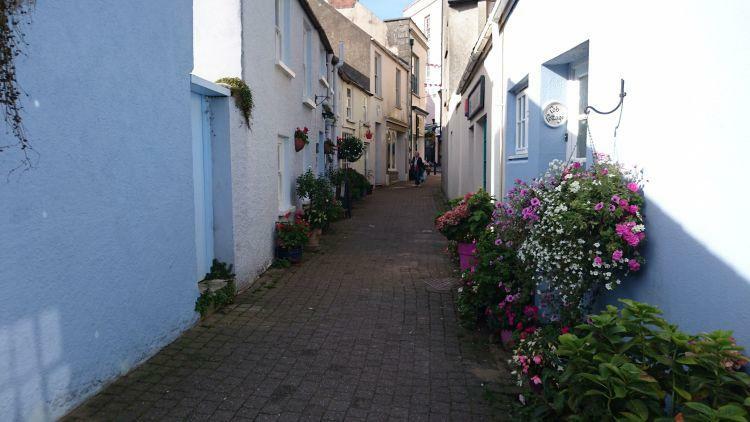 The walk into Tenby is pleasant and Tenby itself thankfully does not prove to be a disappointment. It is charming. I think I will let the photos do the talking, come for a stroll with me. 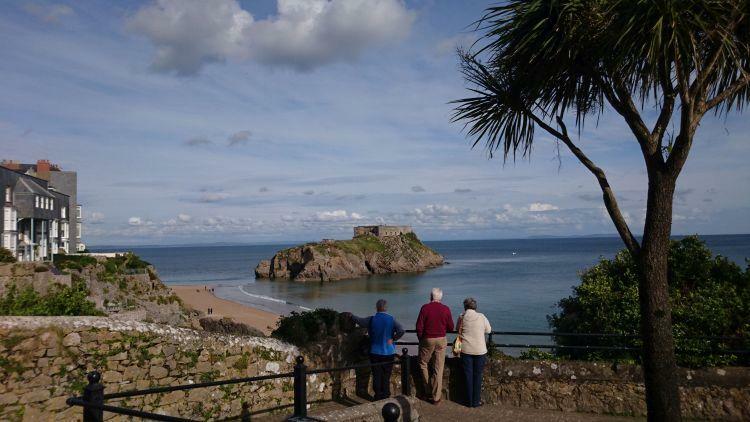 Tropical Tenby. 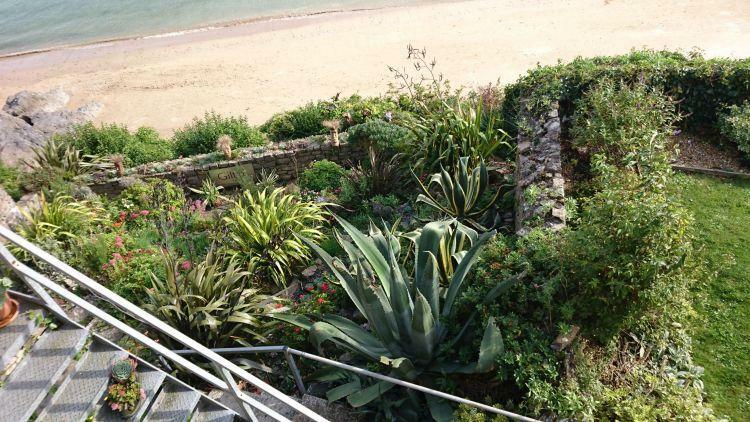 Being on the gulf stream and apparently one of the sunniest places in the UK allows many tropical plants to flourish here. 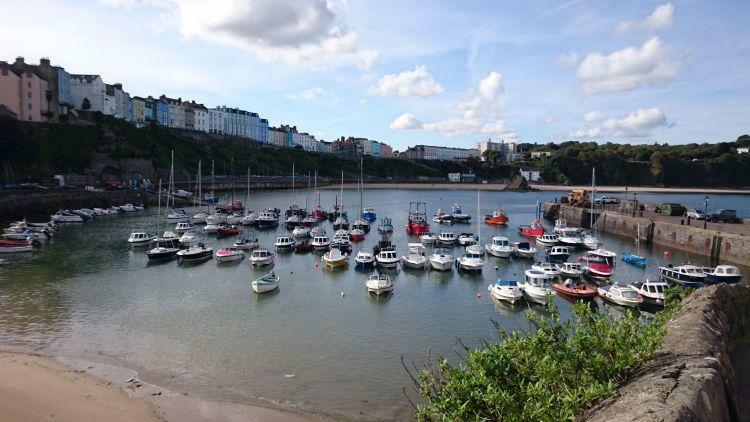 Tenby's working trawlers rest for awhile with the leisure pleasure craft. 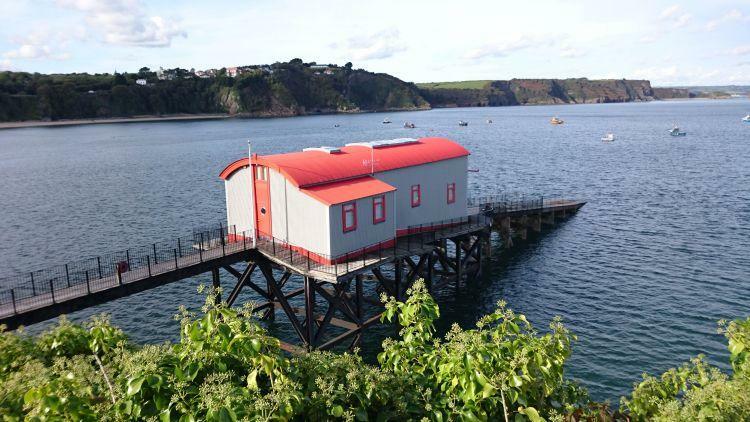 Would you live your life in an ex lifeboat station? Someone has. Sun, sand, sea and ice cream make the perfect day at the beach. 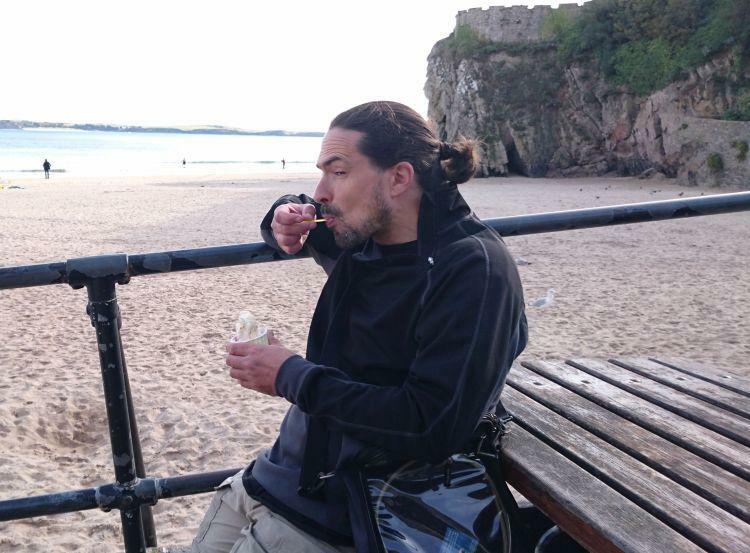 Ren and I have a fantastic relaxing time exploring Tenby. It has been so nice just to stroll around in the sunshine enjoying the sights and each other's company. We finally slowly stroll home hand in hand along the bay that is peppered with some huge driftwood trees. I find myself a tiny driftwood twig to put in my pocket and take home in memory of a very simple and lovely day. Drifting home besides the driftwood.